A large bowl with a raised and stylish panel is what best describes the farm kitchen sinks. In olden days, families in the countryside were large and everyday load of kitchen was huge. Therefore large bowl kitchen sinks were used to accommodate big pots/pans and the huge load of dishes. But they are back in vogue now and people in cities want to install a farm kitchen sink despite a small family size. That is because it adds a very rustic, old world charm to your kitchen. If you have designed your kitchen in a countryside decor, farm kitchen sinks are definitely the ideal choice. Apart from their huge capacities, their depths prevent any water splash (during washing of pots, pans or dishes) or spill out to countertop or the cabinet beneath. Nowadays farm kitchen sinks are available in various materials e.g. stainless steel. Stainless steel farmhouse kitchen sinks are durable, look good and have heat resistant properties. They are also easy to maintain and clean. Single bowl or double bowl, stainless steel farm kitchen sinks are relatively lighter in weight as compared to sinks made from other materials. Though their look has been described by few as ‘clinical’, but they lend a very clean and hygienic look because they are easy to clean. As compared to regular kitchen sinks, stainless steel farmhouse kitchen sinks come with a raised front panel which is like a thick rim. This minimizes water splash and spills. 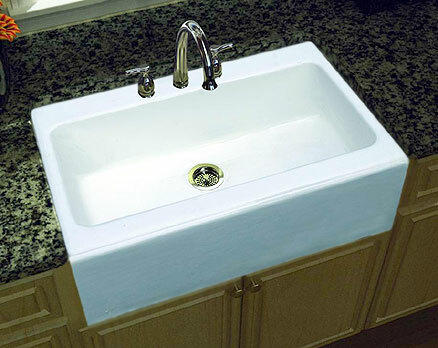 Farmhouse kitchen sinks are also famously known as farmhouse apron kitchen sinks. This is due to the front raised panel which forms an apron between the water-filled sink and you. Farmhouse apron kitchen sinks were designed to endure heavy load of pots, pans and dishes for large families in the countryside. But they have now become popular owing to their deep capacities, functionality and of course the rustic look. Farmhouse apron kitchen sinks may be heavier in weight owing to their size and the material type. A porcelain or fireclay sink may be heavier as compared to a stainless steel. Hence careful installation is required for such sinks. Porcelain farmhouse kitchen sinks give a very vintage look (especially those with a yellowish hue). The general color used is white, which gives a neat look to your kitchen. But it is prone to stains from food residues and cracks (accidental dropping of a heavy pot or pan). Porcelain farmhouse kitchen sinks are heavier in weight as compared to stainless steel. Hence the clamping of porcelain farmhouse kitchen sinks to the countertop needs to be firm and strong. In case you are not sure of doing it yourself, hire an expert/professional. Copper farmhouse kitchen sinks are the most stylish amongst stainless steel, porcelain or fireclay. Handmade and hammered designs add a very elegant and royal look to the entire piece, making it a prized possession of your kitchen. Even the simplest of designs in copper farmhouse kitchen sinks look very beautiful. But they develop ‘patina’ (a greenish hue due to oxidization), which may actually look nice to some people. But, to keep the sink in its polished and shining form, you need to clean this layer regularly (rub half a lemon, with salt on it, along the sink). Farmhouse kitchen sinks in white color are quite in demand as they give a clean look to the kitchen. They can easily hide scratches but may get stained due to food residues. Available in porcelain, acrylic etc., farmhouse kitchen sinks in white are now being manufactured in various designs and capacities. The front panel may have some intricate motif design. Such unique pieces can certainly add great value to your kitchen decor, but come with a high price tag. So you need to evaluate functionality and price while buying one. Though farmhouse kitchen sinks offer a period and vintage style, do consider your actual requirements before purchasing one. Right from your daily load, ease of cleaning/maintaining, your ergonomic convenience in washing (considering the deep bowl of such sinks) to price and decor of your kitchen – there are numerous factors to consider before you really take one home. Click here for the best deals on farmhouse kitchen sinks. Among the well-known manufacturers of farmhouse kitchen sinks are Kohler, Kraus, Franke, Belle Foret, Barclay, Elkay, Vigo, and Whitehaus.